The daily produce is laid in front of us on the ground on a wide Indian motif printed, bright and summery red square cloth. We sit on it, with our legs folded, crossed under. Perhaps a posture only Indians can relate to as relaxed. We teasingly argue about who gets which task to perform. The herbs have to be washed and dried, the cluster beans deveined, the stem plucked of the green chilies and the most sought after task - peel and cube the mangoes, so that one would enjoy sucking the last remaining flesh off the seeds after it's all done. It's messy, but none of the vivid mustard color flesh can go to waste, the king of fruits deserves that respect. 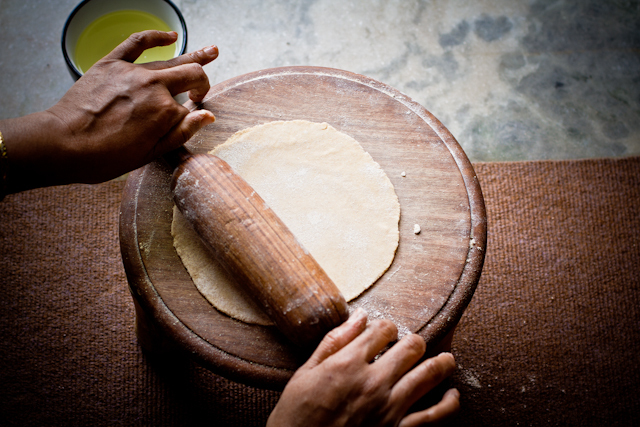 On a cheery Sunday, when the Rajasthan sun decides to be a little less brutal accompanied by a light cool breeze, the sight of fresh green vegetables and happy mangoes is replaced by sheets of paper thin pastry and a carnivores delight - garam masala scented spicy minced meat that will be filled into triangular pastry. There is no division any more, all of us get to the same task - to roll the samosas and eat a few even before they are fried as a reward. It is a family tradition. On one such occasion I happen to mention to my mom how ridiculously popular the lentil stuffed samosa are on the blog. Despite my fears, I mentioned to her using ready to use wraps. There was a look of disapproval on her face. One that I expected and totally know why. Traditional whole wheat wraps have a hearty texture and depth of flavor that beats ready to use, frozen white flour wraps by a mile. These are sturdy, not flake in your hand dry and floury. But the real seal is they are extremely crispy. They sure are labor of love and I won't deny that. But they are so versatile, so delicious and so worth it. 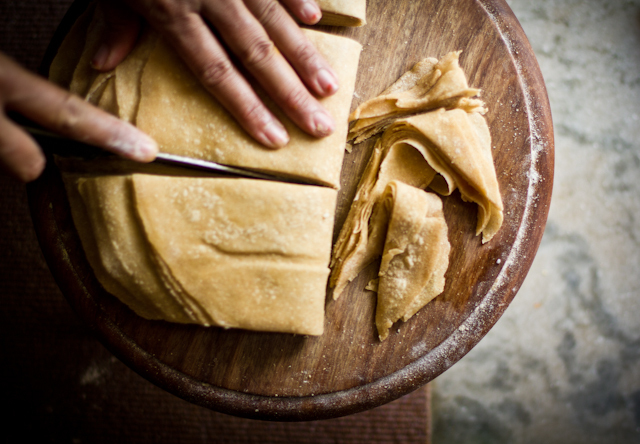 We make samosas and spring rolls with them but you could use them just about in any shape, any filling as you like. Infact, since they are cooked, you could use them as soft wraps as well. After stuffing them with your desired filling, they freeze extremely well too. 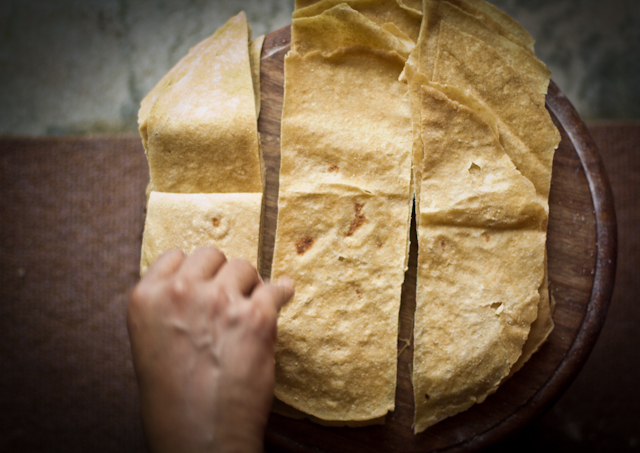 When served like flatbread, these are also called romali roti which literally means handkerchief flatbread perhaps because it folds as easily as a handkerchief. 1/3 cup oil or as required. In a large bowl, stir together flour and salt. Pour in water little at a time and stir until a dough forms. 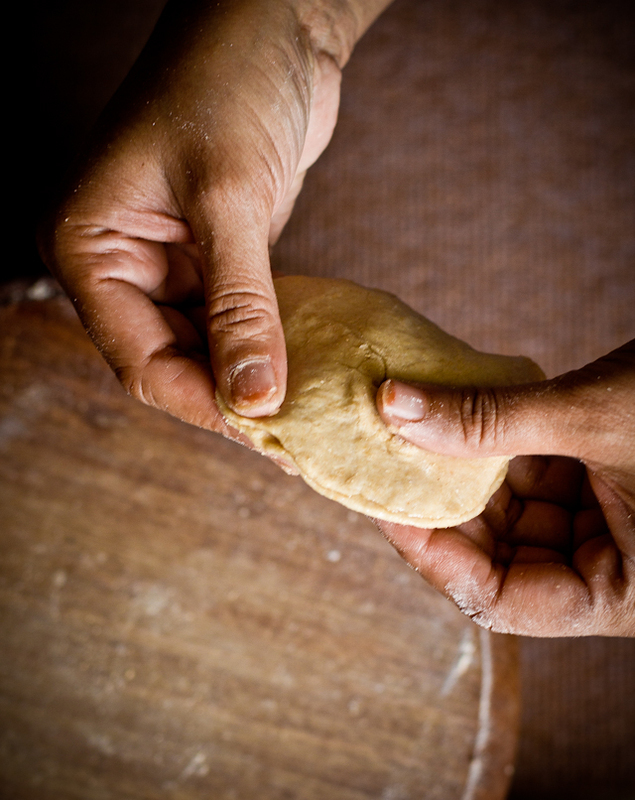 Knead the dough for at least 5 minutes with your knuckles and mix in additional water until a soft pliable dough is formed. The dough shouldn't be sticky, if it is add additional flour and knead. Cover and let it rest for 10 minutes. 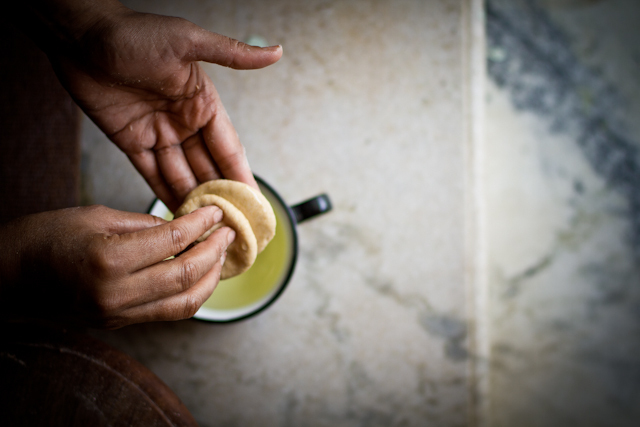 Add 2 tbsp of oil and lightly knead it again for a one minute to get a smooth and shiny dough. Divide the dough in 18 equal size balls. Take two balls and lightly flatten them with your palm. Pinching one of them at the center dip one side in the oil and then into flour. 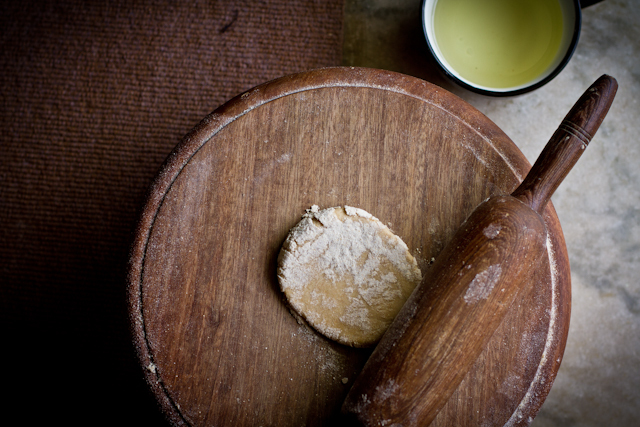 Stick the oil and floured side onto the other flattened ball and pinch them at the ends to glue them together. On a well floured surface and with a light hand roll it from center to outwards into 3 inch round approximately. Turn to the other side and continue rolling until it is 9 inch in diameter (approximately). Flour the surface as and when required so that the rounds doesn't stick. The flipping is to ensure that both the layers roll out evenly. Heat the griddle on medium high heat. Put the rounds onto the skillet for 30 seconds and flip to other side for another 20-30 seconds. Idea is to cook the pastry on both sides enough so the air fills in between and separates the two layers. If the layers don't look like they will separate - cook them on each side for 5-10 seconds further. 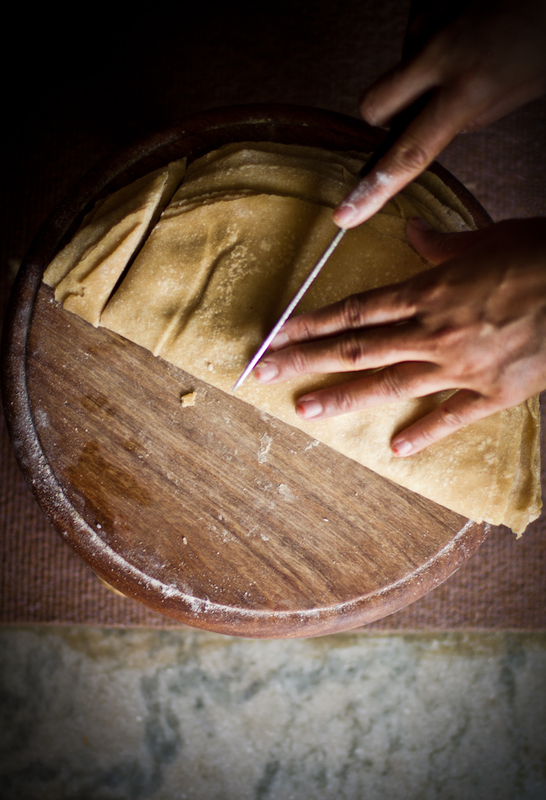 As soon as the layers show sign of separating or the pastry puffs up, remove from griddle and with gentle hands peel off the layer. Wrap them into a cloth covered as you continue making others. Once all the sheets are par cooked stack them up on each other and fold them to create a semi circle. With a sharp knife make three cuts on it to create three trapezoid like shapes. With the above suggested measurements, ideally you should get 2.5 inch trapezoids each. Wrap them back into the cloth until ready to use. They are best used once made as they stay longer they tend to dry out. If you plan to use them immediately cover it with damp cloth. But if you plan to use them after a couple of hours, wrap them well in a cotton cloth and keep away from dry and sunny place. The size of the balls and the rolled out pastry are approximate. For beginners it would be perhaps easier to make even smaller balls so that the rolling is easier. Start with a little thick rolled out pastry and progress into making it thinner with practice.You want to roll it out enough so that you get really nice thin pastry but if you go way too far it will tear. 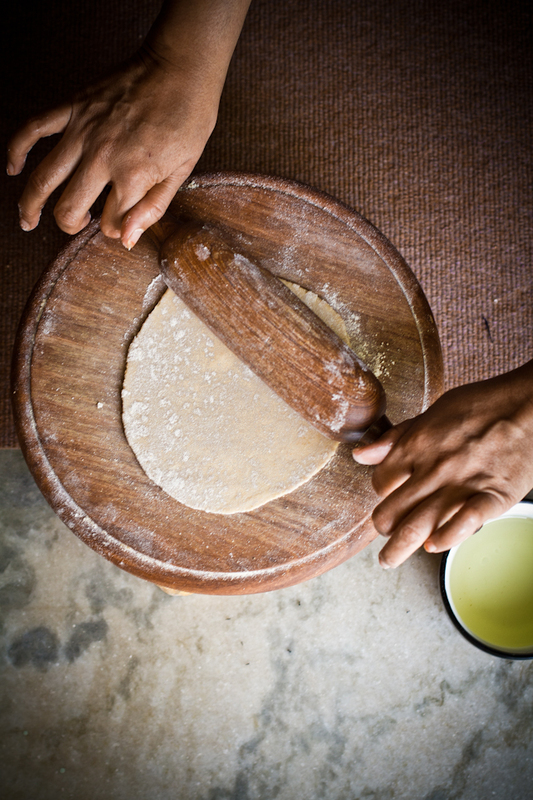 Depending on the size you roll out the pastry, you might get small or larger size trapezoids. . Though I mention them as trapezoids, the middle cut will be more like a rectangle. The trimmings from the sheets make excellent snacks. Just sprinkle them with salt, cumin and cayenne pepper. Bake or fry them until crisp and golden brown. 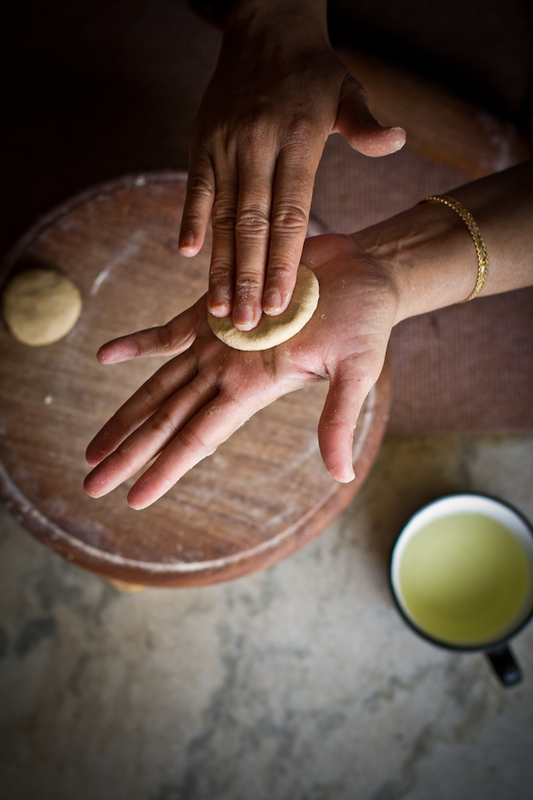 This photo essay is mesmerizing, and you have the most beautiful hands, Kulsum! I totally agree that there is no comparison between homemade n store bought wrappers... The store bought one can never meet the depth n texture of the homemade ones. .. Very detailed Post Kulsum, loved all the pics. I'm so sorry, but I cannot figure out what you do with them after you make them? 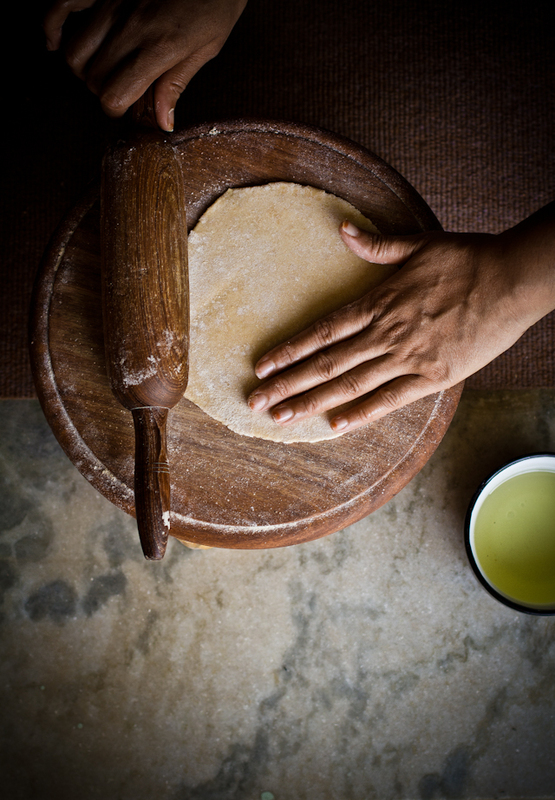 As mentioned in the post we use it for samosas and spring rolls and can also be used as soft wraps like tortillas. Use it like you would use store bought wraps! You can find lentil samosas on the blog. These look delicious! I am saying hello from Ajijic, Mexico. We moved here a month ago. One of the things I am enjoying the most is exploring the food. I think you would too! I haven't tried these either and they look so light and thin. The photographs looks amazing and I love the way you demonstrate the prep work. This is great with Mango Ras!! I always thought these might be hard to make, but you make it look easy. Then again you probably have done it more than a few times. I'll give it a try though. Thanks for the step by step. I dropped in for just a moment, but was entranced by the first paragraph and photo. I read all the way through, transported by the story of sitting on the ground preparing food. How different from life here in California! But I have a few ripe mangoes in my kitchen, so we are also the same. your pictures are stunning as always Kulsum! Are these by any chance similar to roomali roti? 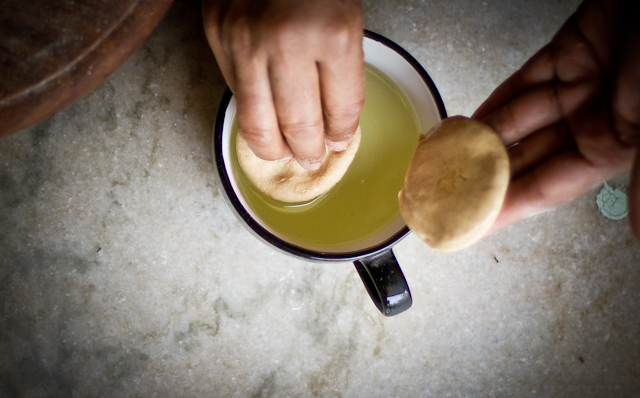 I would love to try these and your samosa recipe! Your photography is stunning, the recipes are brilliant. I've missed your beautiful photos! This sounds so delicious, and what amazing photos!! I just can't get over how great your photos are. I love your overall site theme as well. Kudos! beautiful photos kulsum. loved all of them.